Sarah's Placemat Blog Party has been great success this week. Don't forget to check her blog to see if you won a prize there. For my giveaway to go along with Sarah's Party I had some really great and thoughtful comments as usual. I didn't attempt to reply to all comments and I apologize for that but I read them and smiled, laughed and blushed. Thank you everyone for participating. I know this sounds really corny but I do wish I could send each of you a bag kit and patterns. Kit #1 - Brandie, of ABC Quilts, writes: "I love your bag! I hope I'm lucky this year. Luck seems to revolve around every 4 years for me and I don't know what year I'm on. Great place mats. I love the Halloween one the best." Well, Brandie, you are lucky this time! Good for you. Kit #2 - Susan in NC (reader not a blogger, and that is ok! ), writes: "I love all the different variations of your placemats - this looks like a really fun pattern. Great giveaway - I really enjoy your blog and seeing your creativity." Brandie and Susan please send me your home addresses. I have email addresses for both of you, too so I can get a hold of you as well. Again, thanks everyone. This was fun. Recently I met some of my girl friends including my BFF Lori Holt, who helped me pull some fabrics together for a new pattern I'm working on. She and I like many of the same things and Lori has a fantastic eye. It is great to get help from her. She's just so amazing and creative. 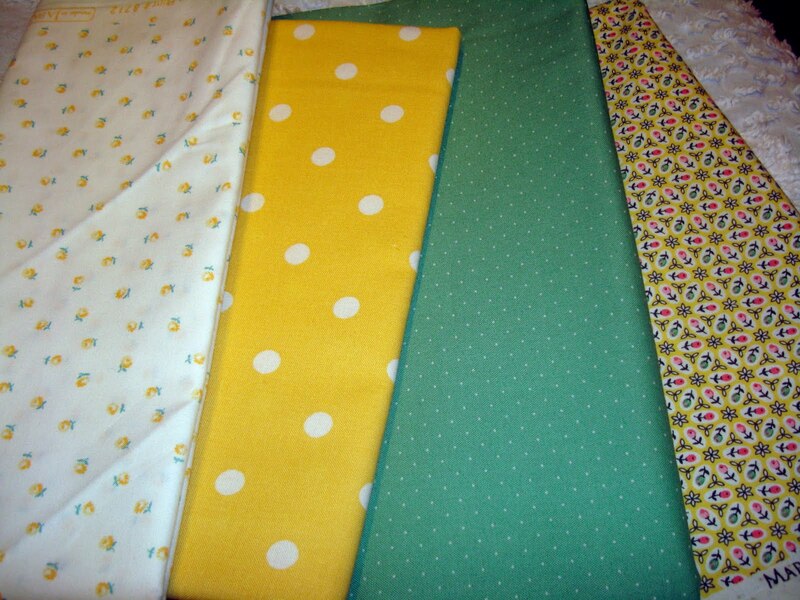 These fabrics are the green and a little bit of yellow to weigh out the great amount of pink in this new quilt. I'm really excited about this project. I just haven't had enough time to develop some of the projects rolling around inside my brain so when I get a chance I get really excited and focused. Next week: More on Lori and the girls as we met at Material Girls Shop with Nadine. Also, who would like to attend a retreat in October in Alpine, Utah? 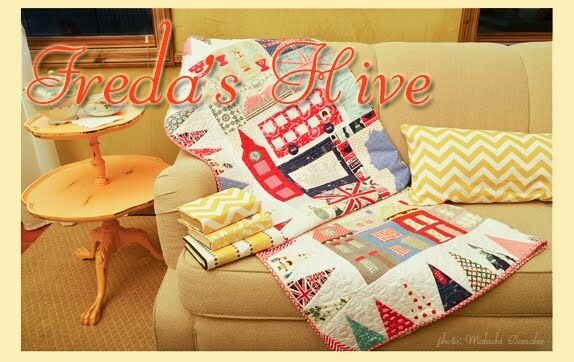 I'll be teaching a class at a fabulous local quilt retreat destination spot. (details pending). Have a great long weekend everyone. Be safe! I'm helping Natalie with some of her quilt projects and want to spend some solid all day sewing time on Monday. Congratulations to the winners. Grandaughter looks so beautiful Nanette. I know she is having fun with grandma. Oh shoot! I can't believe I missed your wonderful giveaway. That's what I get for running around like a chicken w/my head cut off :) Congratulations to the lucky winners. It's a gorgeous bag :) Love the new picture of your little cutie pie and great fabric as usual! Happy 4th my dear and blessings to you and yours always. Allison is so cute in her little tutu. Would love to retreat with you. I remember reading Brandie's comment and thought "hope she wins" and she did. Congrats to Brandie! Allison is ooooo photogenic. She is just adorable in that tutu! Would be so fun to retreat with you but will have to enjoy photos you post instead. I'll be retreating with friends at the end of September. Need to finalize my details for that right after the 4th. Oh, sooo busy! OH OH OH! I'm SO excited! I won, I actually won! Thank you Nanette! Allinson is so gorgeous! Love the skirt she is wearing! 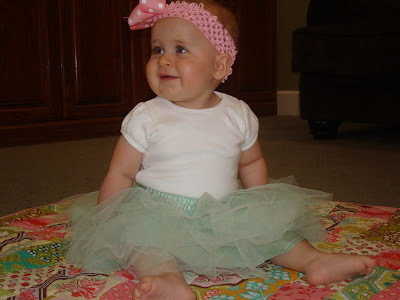 Gotta love a baby in a little green tutu, what a doll she is! Have a fun 4th Nanette! I can't stop looking at your sweet little Allison. She's such a delight. I can't imagine how you get anything done. I'd stop every five minutes to scoop her up and snuggle. Grandma Nan, your heart must be melting to see her smiling at you with that adorable face. She is so cute! Congrats to Brandie and Susan on a great win. All that pink is fabulous!! 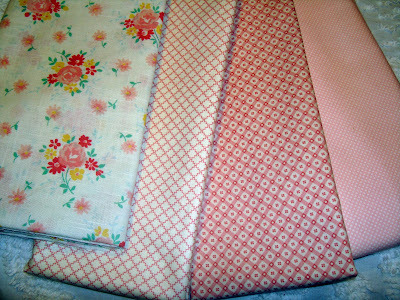 Love the pink second from the left in the last photo of the fabrics. Yummy! Congrats to the winners! What fun! Great big congrats to the winners!!! And thanks so much for the Allison piccy .... ooooh I just love to see that smiling face when I read your blog ..... she's as cute as a bug's ear ;o)!!! 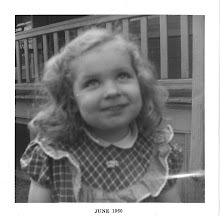 What a cute baby picture -- of course she's smiling at you Grandma! 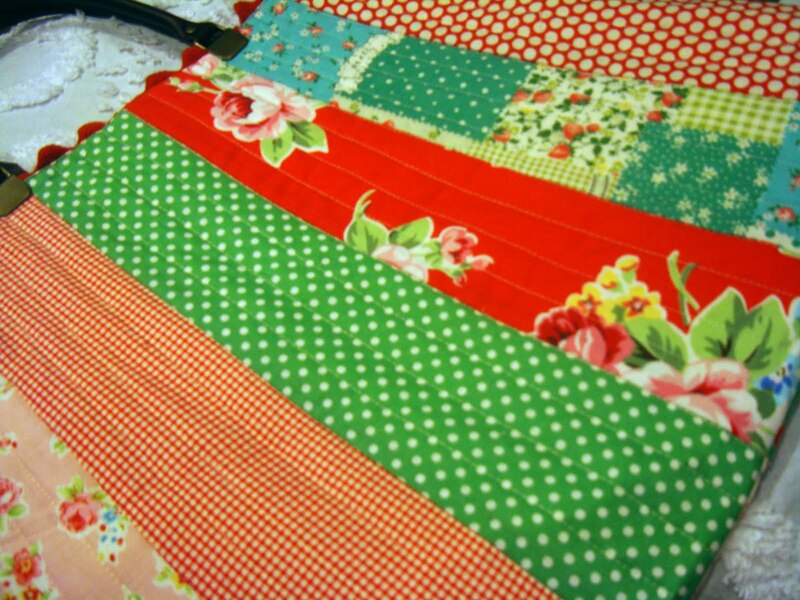 I want to go to go to a quilt retreat! Too bad I'm already signed up for Houston and don't have any more vacation. Boooo for working! Can't wait to hear more though! Congrats to your winnners. I do believe your granddaughter gets cuter with each passing day...which is amazing since I thought she was super-cute from the beginning. How can she keep getting cuter and cuter like that???? 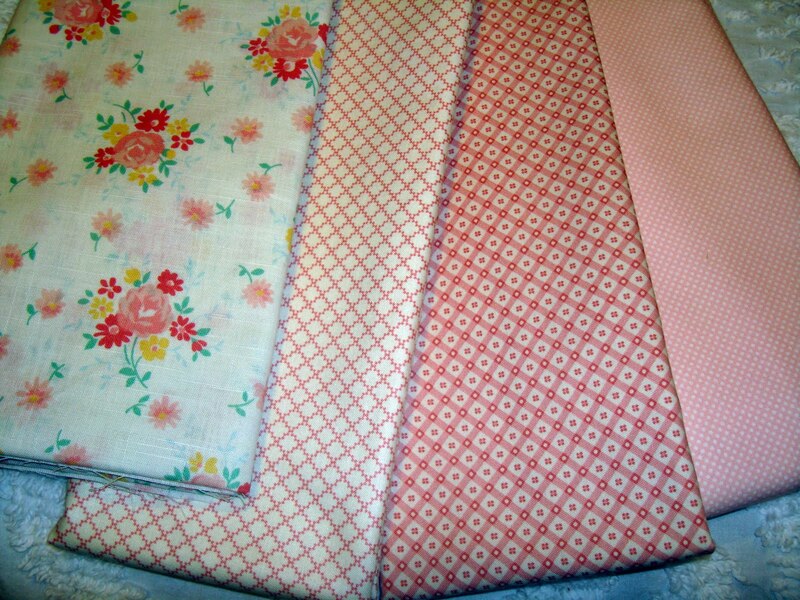 Well, who wouldn't love your placemats....they are FAB and of course who wouldn't LOVE little MS. Allison....yes...CUTE baby with GREEN TUTU included!!! Rats, how did I miss out on this contest? Those placemats are so, SO nice. I love the Holiday Happy one. I've been wondering what to make with my fabs, this may be what I was looking for! Have a great 4th! Oh Lordy Bee! These fabrics. Where Have I Been!!! !